We are very proud to announce that for a second year running following our latest RoSPA (Royal Society for the Prevention of Accidents) safety inspection we were again granted the prestigious Gold Operator Award for the quality of operation of our centre. 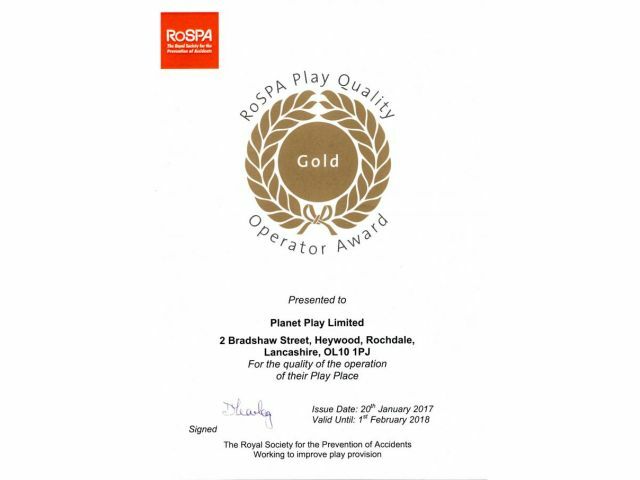 This was given by the head inspector of the Playsafety Company on behalf of RoSPA. There are very few of these awards given and currently only 8 play centres in the whole of the north from the Midlands to Scotland have be granted this award. It is issued for continuous improvement and achievement over at least three years and covers aspects such as management and procedures, maintenance and safety of equipment and cleanliness which we believe are crucial in our centre and important to our customers. We will of course continue our efforts in the future and would like to thank our customers and staff for their continued support.